PRODUCT: 7/8 length x .120 inch 304 Stainless Steel, Ring Shank, Coil Roofing Nails, Wire Collated, 120/coil, 30 coils/box. 3600/Box. Price/Box. APPLICATIONS: Composition Roofing, Underlayments Etc. 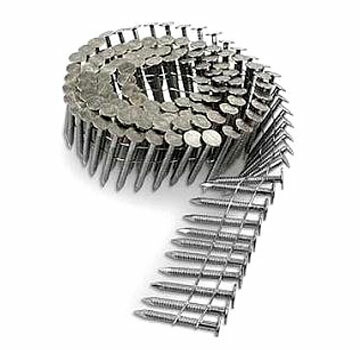 15-Degree Wire-Collated Coil Roofing Nails. ANSI 304 Grade Stainless Steel. 7/8 Stainless Roofing Nails, Ring Shank, Bulk, 1-Lb.